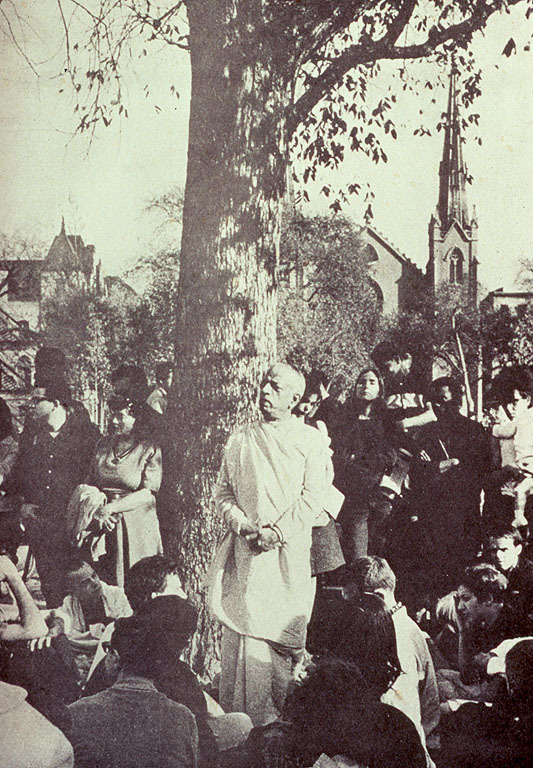 This was my first real introduction to Krishna Consciousness, and it was enough to convince me that Krishna was God. And that Srila Prabhupada was my spiritual master. From the very start, I knew that His Divine Grace A. C. Bhaktivedanta Swami Prabhupāda was the most extraordinary person I had ever met. The first meeting occurred in the summer of 1966, in New York City. A friend had invited me to hear a lecture by “an old Indian svāmī” on lower Manhattan’s Bowery. Overwhelmed with curiosity about a svāmī lecturing on skid row, I went there and felt my way up a pitch-black staircase. A bell-like, rhythmic sound got louder and clearer as I climbed higher. Finally I reached the fourth floor and opened the door, and there he was. About fifty feet away from where I stood, at the other end of a long, dark room, he sat on a small dais, his face and saffron robes radiant under a small light. He was elderly, perhaps sixty or so, I thought, and he sat cross-legged in an erect, stately posture. His head was shaven, and his powerful face and reddish horn-rimmed glasses gave him the look of a monk who had spent most of his life absorbed in study. His eyes were closed, and he softly chanted a simple Sanskrit prayer while playing a hand drum. The small audience joined in at intervals, in call-and-response fashion. A few played hand cymbals, which accounted for the bell-like sounds I’d heard. Fascinated, I sat down quietly at the back, tried to participate in the chanting, and waited. 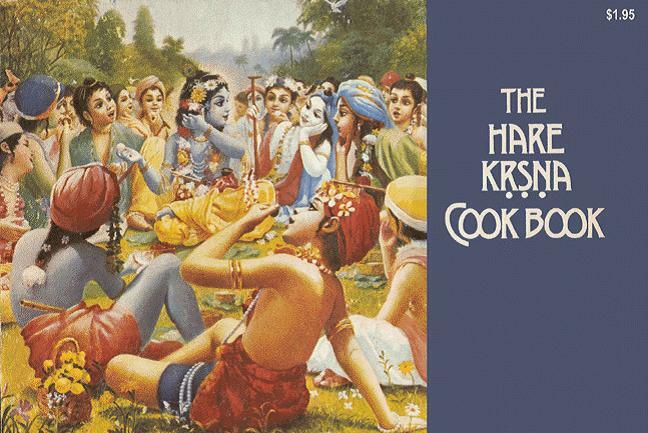 “The Hare Krsna Cookbook”, originally published in 1973, was the first widely distributed book of vegetarian recipes, throughout the Movement. This was the book myself and many early devotees learned to cook from, and remains today my all time favorite cookbook, and is a constant companion in our kitchen. We offer the complete book on a PDF Format as a gift to all our readers this Holiday Season. 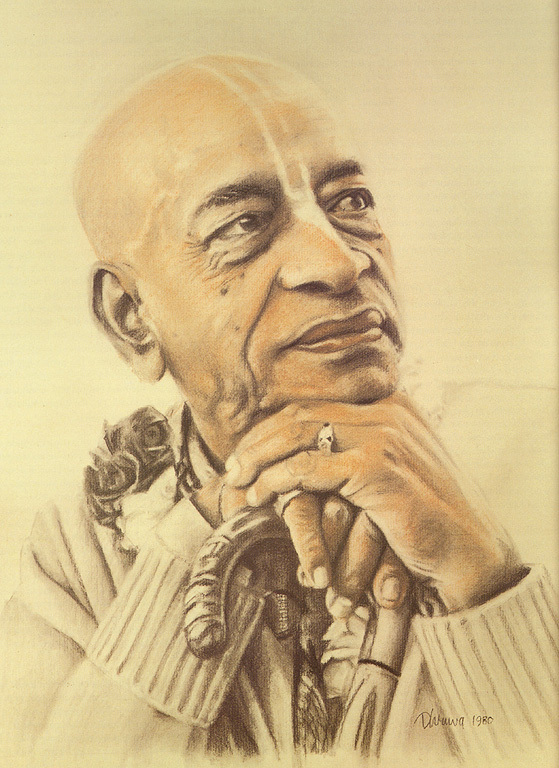 Prasadam means mercy, and this Prasadam Cookbook is dedicated to the fountainhead of all mercy, the spiritual master, His Divine Grace A.C. Bhaktivedanta Swami Prabhupada. 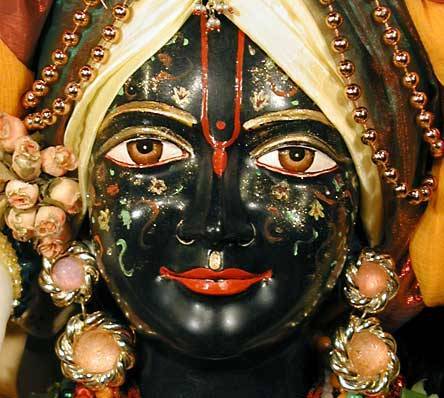 He is by nature kind to every living entity, but that ocean of mercy becomes fully visible in his devotees. 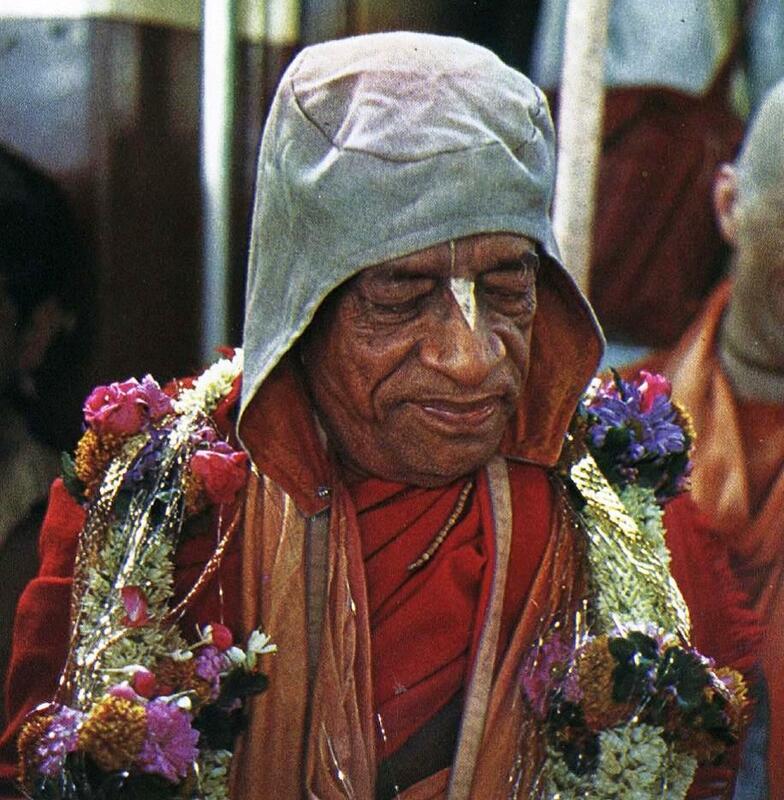 Srila Prabhupada has not given us some dry, canned philosophy to chew; he has given us the nectar for which we have sought so long: he has taught us how to render transcendental loving service to the Lord in all our daily activities. This book illustrates on of them.